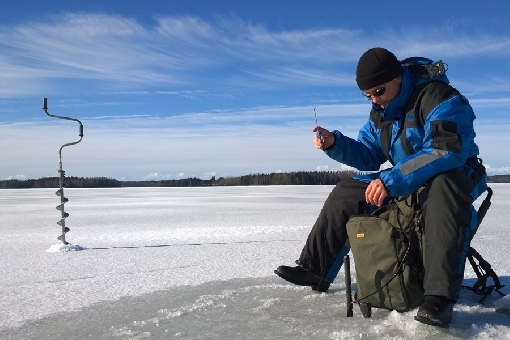 Wiadomości − FishinginFinland.fi - Angler, take care of your thumb! Angler, take care of your thumb! Ice auger with a cordless drill has become popular tool for ice anglers in last few years. The purpose of using battery operated drilling machine with an auger is to make work easier. When there is 50 cm of ice, you need some strength to manage to drill a hole through ice. Anglers should take notice, that there is a severe risk to get injured when using a motor auger. If anglers glove is suddenly grabbed by rotating auger or socket of a drill, angler may even lose his thumb. During last years several thumb accidents have happened in Finland. Hand surgeons are seriously worried of this phenomenon that has become common. To fix an injured thumb may be a big operation and in many cases the thumb won´t be the same as it was before. If you use battery drill machine with an auger, be extremely careful. Don´t think anything else that what you are doing at that moment: making a hole in ice safely. A drill machine used with an ice auger should have a help handle. Machine should be locked when it is not used. At the moment ice thickness is lower than normal. Because of constant snowfall there are lot of snow and water on top of ice. Walking on ice has been a hard job. There may be still thin areas of ice in some parts of lakes and ice holes have formed there and there. Angler and other people who are going on ice should be careful. Hopefully there will be some colder days and nights in next days so the waters on the ice will freeze. If that happens, there will be much better conditions to go.